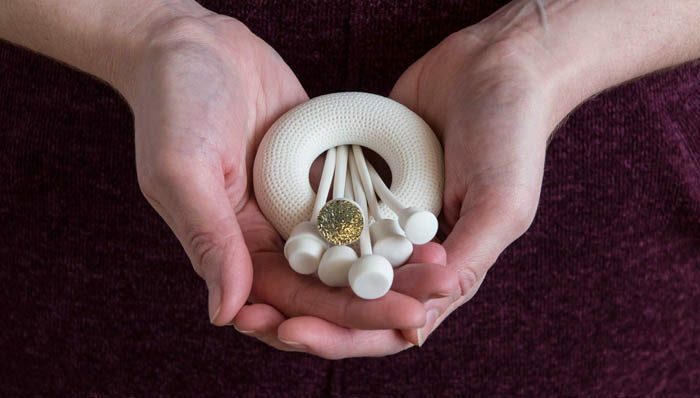 The exhibition NEXUS: meetings at the edge looks at ways 21st-century makers are changing perceptions about their art forms. Nexus, a word meaning connection or a series of connections linking two or more things, presents work by 20 artists who are linked by great technical skill, a capacity for free-thinking and confidence in their ideas. None of the work in this exhibition may be quite what it seems. Some have adapted characteristics of one field, such as textiles, to another, such as jewellery. Some make innovative work with traditional materials and techniques, while others use new materials and methods. Some pieces were directly influenced by music; others were inspired by the effects of light or movement on their appearance. Several pieces in the exhibition are hybrids and impossible to categorise. Kate Haywood trained in ceramics but her first degree was in jewellery design. Her work explores the role objects play in the forming and triggering of memories, and how we understand them in the light of our personal experiences. She makes pieces that may look functional at first sight, but this functionality is never fully carried through. 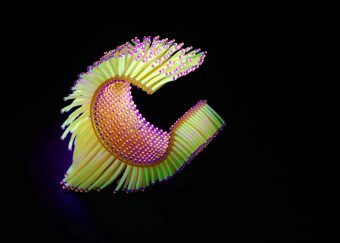 The Go with the Glow bangle by Wanshu Li is largely inspired by the brilliant colours and sensuous movements of sea creatures like the jellyfish and sea anemones now familiar to us from television programmes such as Blue Planet II. Through experimenting with ultravioletreactive nylon and fluorescent paint she adds a further dimension to her jewellery which glows with an intense colour when lit with UV light. The exhibition includes work from both established and emerging artists from around the UK: Jane Adam; Michael Brennand-Wood; Susan Cross; Rajesh Gogna; Janet Haigh; Kate Haywood; Zoe Hillyard; Genevieve Howard; Andrew Lamb; Ruth Leslie; Wanshu Li; Anna Lorenz; Lynne MacLachlan; Catherine Martin; Valeria Nascimento; David Poston with Jonathan Cleaver; Jacky Puzey; Romilly Saumarez Smith; Adi Toch. It was curated by Dr Elizabeth Goring and produced by Fife Contemporary in partnership with Ruthin Craft Centre in Wales. The exhibition opened at Kirkcaldy Galleries (31 March – 10 June 2018) and is now at Ruthin Craft Centre. To accompany the exhibition an online publication has been produced which features information about all the artists in the exhibition, and includes images of their work. Until 18 November this is completely free to download, after that date there will be a small charge.